The list of speakers is available! 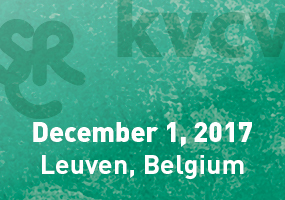 The Medicinal Chemistry Divisions of the two Belgian Chemical Societies, Koninklijke Vlaamse Chemische Vereniging (KVCV) and Société Royale de Chimie (SRC), are organising every year an international one-day symposium in Belgium, with the aim to update participants on selected areas of pharmaceutical research by specialists in their respective field. The objective of the one-day symposium is to delve into the latest developments of the applications of nucleosides, nucleotides and nucleic acids in medicinal chemistry. In the past, the applications where situated mainly in the fields of antivirals, anticancer compounds and antisense oligonucleotides. More recently, new therapeutic applications, for example in immune-oncology, and the discovery of new functions of nucleic acids in the cell such as siRNA, Crispr/Cas together with new breakthroughs in in vitro selection technologies (XNA aptamers), have revived the field and have opened many new possibilities for drug design. The present knowledge in these different research areas will be presented during the symposium.